Private and Confidential Drug Testing: 100% confidential and anonymous;no personal information is required. Each test has its own unique Specimen ID number. Accurate and Reliable Testing Results: We use a nationally accredited and recognized testing facility. Our laboratory uses the latest technology with state of the art equipment. Enzyme Immunoassay (EIA) and GC/MS technology confirmation tests are used. Detailed Analysis of Drug History: Results include a positive or negative result for each hair class. In addition an assessment of hair dose response to identify whether the user is a low (occasional), medium (weekend/daily) or high (constant) user is provided. Hair testing is the most accurate and effective method of finding users of drugs. The testing technology is designed to show the presence of drug levels which would only be consistent with the ingestion of drugs. All samples are tested using a radioimmunoassay screen. Before any positive test result is reported, the sample is subjected to a second, confirmatory test using gas chromatography/mass spectrometry (GC/MS), considered the gold standard for forensic drug testing. 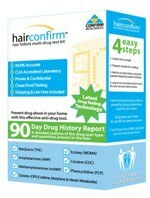 What drugs does HairConfirm® screen for? 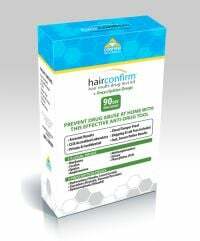 HairConfirm® screens for five different drug classes: Cocaine (cocaine and benzoylecgonine), Marijuana, Opiates (Codeine, Morphine and 6-monacteyl morphine), Amphetamine (Meth/amphetamine and Ecstasy) and Phencyclidine (PCP, angel dust). What time period does the HairConfirm® test cover? 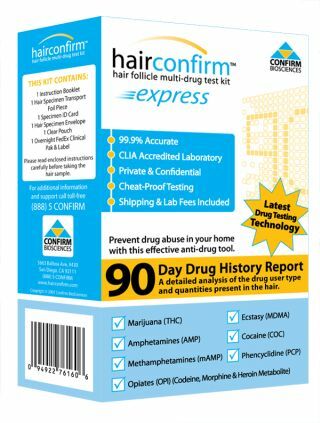 HairConfirm® will detect drugs for an average period of 90 days. When compared to the more traditional forms of testing, i.e. urine testing, hair samples can detect a longer period of drug use. In side-by-side comparison studies with urinalysis, hair drug testing has uncovered significantly more drug use. In two independent studies, hair drug testing uncovered 4 to 8 times as many drug users as urinalysis for evidence of drug use. Enzyme-immunoassay antibodies (EIA), similar to those used to test urine, are used for the initial drug screening in hair;therefore the potential for substances such as over-the-counter medications to cause a false positive screening result does exist. To eliminate the possibility of reporting a false-positive result due to cross-reactivity, our laboratory performs Gas Chromatography Mass Spectrometry (GC/MS) for all specimens that screen positive. Hair can be collected from several head locations and combined to obtain the required amount of hair. If the head hair is too short, body hair can be used as a substitute. Using the detailed instructions as a guide, collect a hair sample of approximately 90-120 hairs. Mail the hair sample to our laboratory, using the pre-addressed envelope provided. The laboratory will analyze the hair sample for evidence of drug use. Using your HairConfirm® Specimen ID number, passcode and email address, you must register your test once you have mailed the samples to the laboratory. Go to the results section to obtain the results. How long will it take to receive the results? We know it is important that you receive results as quickly as possible. HairConfirm® has the fastest turnaround time for hair testing. Using the shipping label included in this kit, the laboratory will receive the sample the next business day. Tests results are available 2 business days after the sample has been received by the laboratory. Our lab is accredited by the Clinical Laboratory Improvement Amendments (CLIA) and all tests are supervised, reviewed and approved by Ph.D. staff scientists. We have performed over 1.5 million hair tests. What cut off levels are used by HairConfirm? Does the lab provide Gas Chromatography Mass Spectrometry (GC/MS) confirmation for all positive results? Yes, GC/MS confirmation is performed on all positive results to avoid any false positives. How will I obtain the results? After you have mailed the hair sample, you must register your test at https://www.hairconfirm.com/register.asp to obtain your results. You will need your Specimen ID number, passcode and email address to register. The results will be available approximately 2-3 business days after the hair sample is received by the laboratory. How will I read the results? The results will indicate a positive or negative result for each drug class. In addition, when a donor tests positive, the result will provide an assessment of hair dose response to identify whether the donor is a low (occasional), medium (weekend, daily) or high (constant) user (not including Marijuana). Yes, the results are kept completely confidential and are for your use only. No names or social security numbers are used in the testing process. The only identification is the specimen ID number provided with the kit. Does hair color affect results? Hair color is determined by the amount of melanin in the hair. It has been shown experimentally, through actual hair samples, as well as determined in court, that hair color has NO basis in fact. MoreI was clean. I took a sample of beard hair and sent it in to the lab using the prepaid overnight envelope and got results 1 day after the lab received my sample. They came back negative. The test was extremely useful and easy to use. Well worth the money spent. Now I can proceed to my actual follicle test with confidence. I would highly recommend this kit to anyone who wants to be sure they are clean before a follicle test. Moreong dreads and smoke like a broke pot belly stove. I use the mucujo method and it worked thanks test clear. This is a great test. Paid to overnight it and test results were delivered by email within 3 business days. Very accurate and easy to understand. Mores in the designated packet, and mail in the included shipping envelope. The Express offers over night shipping but the test itself still takes up to 3 full business days, not including the day it arrives. If the test is positive, the results come back with very specific amounts so you can tell the exact amount of each substance, and its metabolites, that are in the hair. Since there are different tests with different cutoff levels, i'm not sure if I will pass the test I need to take for work, but this home test definitely gave me a good understating of where I stood. My only recommendation to hairconfirm would be to offer a test with lower cutoff levels, or one that would perform a "specific level' test regardless of how little of the substance is in the hair.